We have 15 years of extensive experience in recovering your data from RAID servers. Our highly professional expert can help you in recovering the data that might otherwise be considered lost. The term RAID stands for Redundant Array of Independent Disks, originally defined as Redundant Array of Inexpensive Disks. R.A.I.D storage uses multiple disks to improve overall performance, increase storage capacity and provide fault tolerance. This was an improvement on older storage devices that used only a single disk drive to store data, sometimes referred to as a SLED (Single Large Expensive Disk). In 1987, three Berkeley researchers David Patterson, Garth A. Gibson, and Randy Katz- first defined the term RAID and the theory of spreading data across multiple drives to improve system performance.Raid disk drives are not required for personal computers and are usually used for high end servers or commercial business. With RAID technology data can be mirrored on one or more disks in the same array. This means that if one disk fails, the data is safely preserved. Using a technique known as striping where data is spread over multiple disk drives, RAID also offers the option of reading or writing to more than one disk at the same time in order to improve performance. Sequential data is broken into segments which are sent to the various disks in the array. A typical RAID array uses multiple disks that appear to be a single device so it can provide more storage capacity than a single disk can alone. Provides data striping (spreading out blocks of each file across multiple disk drives) but no redundancy. This improves performance but does not deliver fault tolerance. If one drive fails then all data in the array is lost. Provides disk mirroring. Level 1 provides twice the read transaction rate of single disks and the same write transaction rate as single disks. Not a typical implementation and rarely used, Level 2 stripes data at the bit level rather than the block level. Provides byte-level striping with a dedicated parity disk. Level 3, which cannot service simultaneous multiple requests, also is rarely used. A commonly used implementation of RAID, Level 4 provides block-level striping (like Level 0) with a parity disk. If a data disk fails, the parity data is used to create a replacement disk. A disadvantage to Level 4 is that the parity disk can create write bottlenecks. Provides data striping at the byte level and also stripe error correction information. This results in excellent performance and good fault tolerance. 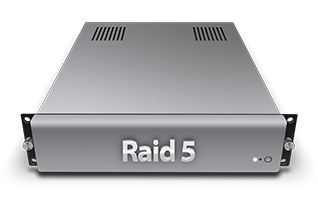 Level 5 is one of the most popular implementations of RAID. Provides block-level striping with parity data distributed across all disks. Not one of the original RAID levels, multiple RAID 1 mirrors are created, and a RAID 0 stripe is created over these. Not one of the original RAID levels, two RAID 0 stripes are created, and a RAID 1 mirror is created over them. Used for both replicating and sharing data among disks. A trademark of Storage Computer Corporation that adds caching to Levels 3 or 4. A RAID 1 implementation with more than two disks. Data striping is combined with mirroring each written stripe to one of the remaining disks in the array. Also called Parity RAID, this is EMC Corporation’s proprietary striped parity RAID system used in its Symmetrix storage systems. Through RAID serve, you can do data storage and retrieval from different drives at the same time. The RAID servers can be used in big corporations, business houses and homes. Heavy usage of the hard drives inside them can damage them. Sometimes firmware issues can lead to RAID server failure. We have enough experience in dealing with RIAD server issues and can retrieve the data after RAID server disk failure. Mechanism failure in RAID server can develop malfunction in the drive. If you are not eliminating such issues immediately, it can create massive issues and huge data loss. Suffering from a RAID server failure? Contact us now, and our expert will give you best advice for data recovery. The rebuilding of a RAID server is quite complex. After RAID server rebuild, you may face problems like boot failure or unsuccessful data restoration. We can assist you with a successful RAID server rebuild. Our experts know how to retrieve data from RAID array after unsuccessful RAID rebuild. Firmware carries information and regulates the RAID server. If it gets out of date and corrupted, it will affect other RAID drivers, and you will be not able to store the data. During firmware update, you can face issues, and that will affect the communication in RAID servers. Well, if you have such problems, then no need to worry now. We have experts who know how to recover data from a RAID drive damaged after firmware corruption. RAID data recovery is the process of recovering and restoring data from a RAID storage infrastructure. Using a combination of automated and manual data recovery processes to extract and restore data from one or more RAID drives and storage components. RAID data recovery can be implemented on both hardware- and software-based RAID. RAID recovery requires reconstruction of all RAID storage arrays to original or confirmed good settings and configuration. We must know the RAID configuration at the hardware, software and firmware level to successfully retrieve data. Identifying the correct RAID array is an essential part of the RAID recovery process.